Saguache County is one of the 64 counties in the U.S. state of Colorado. As of the 2010 census, the population was 6,108. The county seat is Saguache. 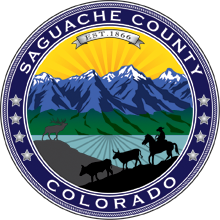 Saguache County was formed December 29, 1866, in the Territory of Colorado as a partition from Lake County. According to the U.S. Census Bureau, the county has a total area of 3,170 square miles (8,200 km2), of which 3,169 square miles (8,210 km2) is land and 1.7 square miles (4.4 km2) (0.05%) is water. Liberty Road historic mail route open to foot, horse, and bicycle travel between Crestone and the ghost towns of Duncan and Liberty crossing the Baca Mountain Tract Rio Grande National Forest. Sand Ramp Trail, a hiking trail within the Great Sand Dunes National Park and Preserve which skirts the east and north of the dune field. As of the census of 2000, there were 5,917 people, 2,300 households, and 1,557 families residing in the county. The population density was 2 people per square mile (1/km²). There were 3,087 housing units at an average density of 1 per square mile (0/km²). The racial makeup of the county was 71.29% White, 0.12% Black or African American, 2.06% Native American, 0.46% Asian, 23.00% from other races, and 3.08% from two or more races. 45.26% of the population were Hispanic or Latino of any race. There were 2,300 households out of which 33.40% had children under the age of 18 living with them, 52.70% were married couples living together, 11.00% had a female householder with no husband present, and 32.30% were non-families. 26.90% of all households were made up of individuals and 7.70% had someone living alone who was 65 years of age or older. The average household size was 2.56 and the average family size was 3.15. In the county the population was spread out with 28.40% under the age of 18, 7.90% from 18 to 24, 26.00% from 25 to 44, 26.90% from 45 to 64, and 10.80% who were 65 years of age or older. The median age was 37 years. For every 100 females there were 101.70 males. For every 100 females age 18 and over, there were 99.70 males. The median income for a household in the county was $25,495, and the median income for a family was $29,405. Males had a median income of $25,158 versus $18,862 for females. The per capita income for the county was $13,121. About 18.70% of families and 22.60% of the population were below the poverty line, including 27.60% of those under age 18 and 12.50% of those age 65 or over. Saguache County has nine locations listed in the National Register of Historic Places. ^ Benson, Maxine (1994). 1001 Colorado Place Names. Lawrence: University Press of Kansas. ^ The place name "Saguache" is pronounced . This name derives from either the Ute language noun "sawup" meaning "sand dunes" or the Ute "Sa qua qua chi pa" meaning "water of the blue earth." The Spanish language version of this name is usually spelled "Saguache", while the English language version is usually spelled "Sawatch".